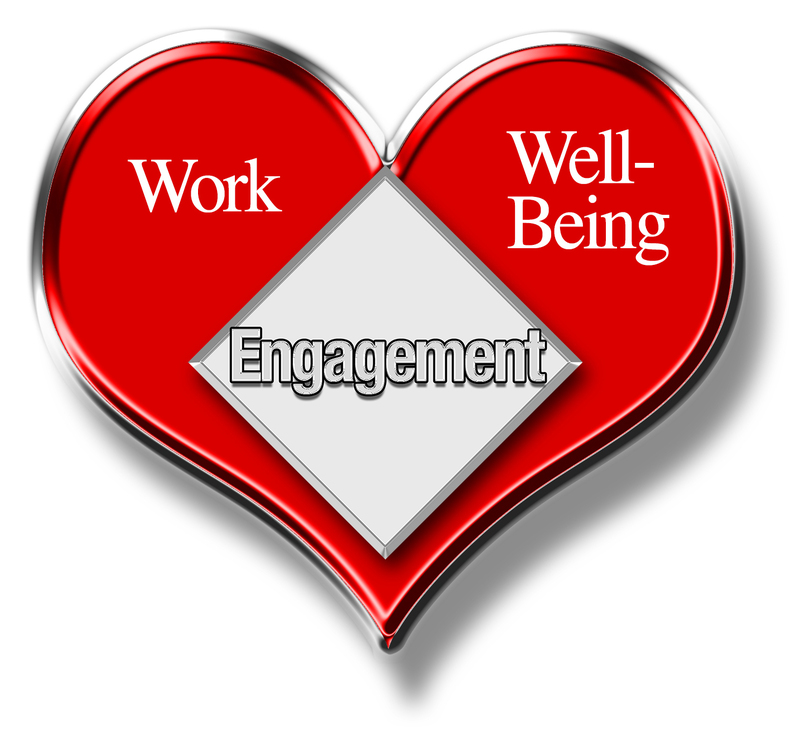 Employee Engagement: Let’s guard against creating disengagement in our efforts to improve employee engagement. Iatrogenic disengagement is the disengagement caused by trying to measure or increase engagement. It is often unintentional and frequently goes unnoticed. I am offering you two resources to help stop iatrogenic disengagement where you work. The first is a one minute video on the topic. The other resources if a slide presentation that can also be downloaded as an e-book. Use these resourses to increase awareness and stimulate conversation about iatrogenic disengagement where you work. Iatrogenic Disengagement from David Zinger on Vimeo. David Zinger is a global employee engagement speaker and expert. 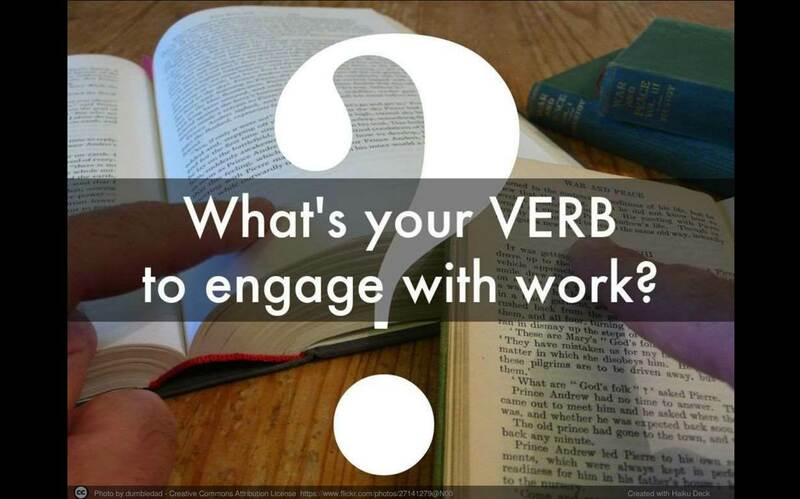 Employee Engagement: What’s Your Verb? Reading and Viewing Time: 1 minute, 22 seconds. Below is a visual slide show with 37 verbs for employee engagement. Scan the slides for 37 seconds of inspiration to start your day. Pass on the slides to a coworker to make their day. Download the slides to use in advance of an employee engagement presentation. Show the slides to a training group and have them generate their own verbs. Create a personalized deck of your own engagement verbs. View if on your smartphone or tablet while waiting for a meeting to begin. Answer the question: what’s your verb? David Zinger is an employee engagement speaker and expert who brings engagement alive through behaviors and actions. His 3 word theme for 2014/2015 is the repetition of the verb engage. Are you game for a simple approach to improve engagement with work and well-being? 10 Lessons for Gamification. Based on David Zinger’s personal experience this post offers you a simple and lean approach to using gamification for engagement. Although it is an experiment with just one person it offers some tangible evidence of how gamification can improve both work and well-being and how an experiment can help us improve the process of gamification. The post also offers you a glimpse into gamification based on a real experience and offers you a pathway to gamification that can be conducted at almost zero cost and does not require a training course to implement. At times, I have struggled to start major projects. At times, I find that either my work or well-being begins to wane. At times, I wonder what I have accomplished. At times, I wonder if drudgery (as I define it) can be used to enhance well-being. At times, I wonder if my childhood love of pinball has any relevance for my work and well-being. This lead me to the conclusion that the time was right to personally experiment with the gamification of work and well-being. I believe we should never ask anyone to do what we are not prepared to do ourselves and I know I had advocated for the place of gamification in work and well-being. It is interesting to me that although I am self-employed I can be disengaged. We often fail to see the disengagement of the self-employed when we believe organizations are responsible for engagement. There were also times that I let my efforts towards personal well-being languish. I needed some structural help with my work and well-being and decided that the gamification of these two key elements of my life could be helpful. I have been amazed at just how helpful this has been. I have eliminated most procrastination around big projects. I found well-being in doing housework and Costco shopping, two activities I previously loathed. I have triggered additional social contribution/donations. Overall, I learned that games are so much more than just a trivial pursuit. 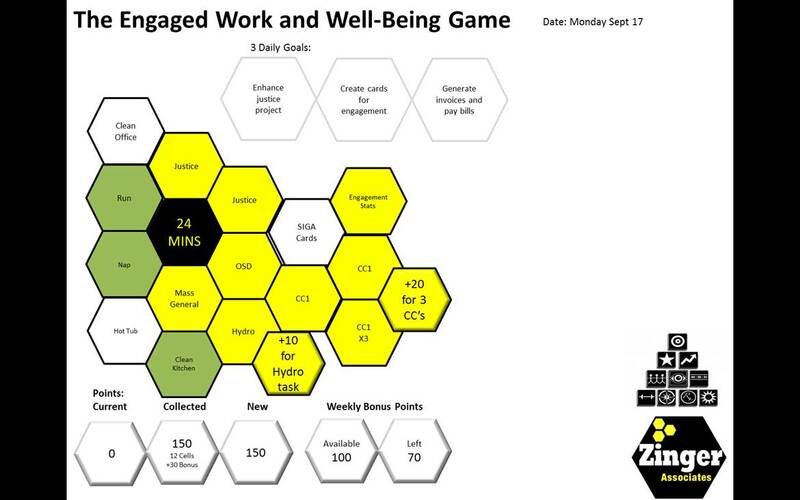 During 2014, I have been conducting a one year experiment on the gamification of work and well-being. In fact, some of the work goes back to 2012 with an elaborate approach to planning, monitoring, and measuring my work and well-being. Although many people play games as diversions from work I was more interested in applying the principle of games to be help me immerse more fully into both my work and well-being. I continue to use a gamified approach to my work and well-being but I have greatly simplified the process and procedures. Two factors were at play in the evolutionary simplicity. The first was my overall approach to employee engagement and work being based on the principles of: small, simple, significant, sustainable, and strategic. I must practice what I teach. I realized that my game was too elaborate and time consuming and needed to be simpler and smaller to be sustainable. I believe that in our “crazybusy” lives that small is the new significant. Jane McGonigal, one of the world’s leading experts on gamification, states that, overall, games have four traits: a goal, rules, a feedback system, and voluntary participation. Everything else is extra. Charles M. Schwab, the American steel magnate, in the early 1900s wrote about the practice of gamification in Succeeding With What You Have. He recounted the following story. Schwab was concerned about production in one of his steel mills and asked the day foreman for the production number, or “heats” produced, by the day shift. It was six, so Schwab grabbed a piece of chalk and wrote a large number six on the floor. The night shift saw the number and asked about the meaning of it. Upon hearing that Schwab had put down six for the productivity of the day shift, the night shift competed hard and, based on their productivity, they erased the number before morning and put down seven. The day shift, getting into the “game,” completed 10 heats and very quickly this mill, formerly the poorest producer, was turning out more than any other mill in the plant. With minimal application of a goal, rules, feedback system, and voluntary participation, the “game” greatly enhanced the productivity of this workforce more than a century ago. Who would have thought that Schwab was an early work-gamification designer even if he never used the word? It was time for me to remove and reduce the extraneous bells and whistles in my game and thereby strengthen its focus, power, and purpose. The next two images show the evolution of the game from what it was to what it is. A short description about the game is above each image. Version 1: This is the initial version of the game. The game board was a fresh PowerPoint slide created each day. It had lots of colors and moving parts. There were goals, points, bonus points, and a hive like structure. I filled in the hive cells with every 24 minutes of work or wellbeing once achieved (yellow for work and green for well-being). I thought it might make a nice mobile app but I began to wonder if it could not be a lot simpler. In addition, the Pomodoro technique that I discovered the third year into my experiment has already built apps that can be used for this purpose. Sometimes I seemed to be spending more time on the game dynamics than time on meaningful work and well-being. 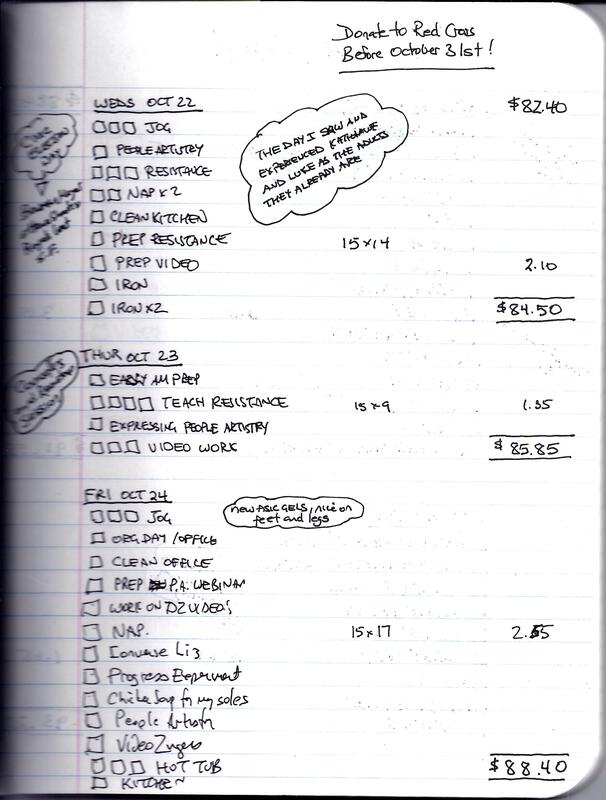 Version 2: Below is a scanned page from my current gamification of work and well-being. In some ways, it hardly looks like a game at all yet it elegantly fulfills my 6 purposes. The game board is a physical notebook, completed by hand and and I experienced a power and trigger in having a very tangible game book that I can carry around. I reduced the time periods of work and well-being from 24 minutes to 15 minute increments – this makes it easier to start each period, knowing I only have to go for 15 minutes (I have learned how much can be done with just 15 minutes — it still amazes me). I also experienced how refreshing a nap of just 15 minutes could be. Each 15 minute period awards 15 points which translates to a social donation of one cent a point. Yes, this is not a large amount of money but I found if the amount was 10 cents a point it did not work as well as one cent a point. For example, on Thursday October 30 I donated $100.40 to the Red Cross to support Ebola work based on work and well-being points accumulated over the past two months. My gamification was used to create this post. It took seven 15-minute periods and it will contribute $1.05 towards a social contribution. David Zinger is an employee engagement speaker and expert who believes we must practice what we teach. His love of pinball at sixteen is paying dividends in his gamification of work and well-being at 60. 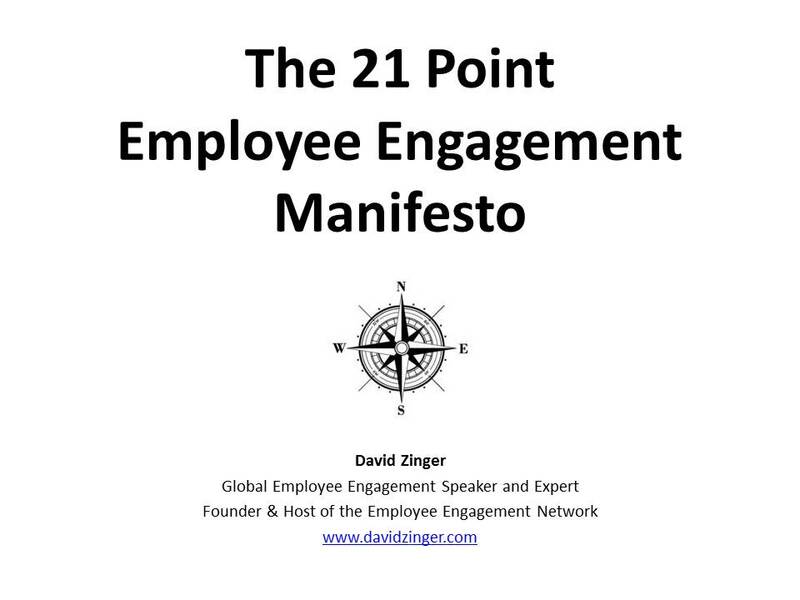 I am currently crafting a 21-point manifesto for employee engagement. Look for this action manifesto within the next two weeks then engage along with me because the best is yet to be.